Inception: Worth More than One View | personal.amy-wong.com - A Blog by Amy Wong. I wonder if I’ll have time to catch this for the 2nd time this week. Anyway, I thought I should post my review for Inception here, so I could participate on the LAMB, because I don’t usually get to participate much. I gotta take any chance at ‘world premieres’ and early… or somewhat early releases. I actually reviewed this in Spanish over at TOMA-UNO. Inception had been the most anticipated film of this Blockbuster season. I mean, we are talking about Christopher Nolan — whom people are referring to as the new “insert name of any filmmaker” [Hitchcock/Kubrick] — with his stellar cast that includes Oscar nominee Leonardo DiCaprio, Oscar nominee Ellen Page, Oscar nominee Ken Watanabe, Oscar Winner Marion Cotillard, Oscar Winner Michael Caine, as well as Golden Globes nominees Joseph Gordon-Levitt and Cillian Murphy. No doubt, Inception has a dream cast and crew. In it, DiCaprio plays Cobb, a man on the run from the US system who happens to work on what is known as “subconscious exploration” which refers to entering your brain while on a dream-state to obtain information. Cobb is hired by Saito (Watanabe) for an impossible task to secure the disintegration of the competition’s company. For this to happen, Cobb must enter the mind of Robert Fischer Jr. (Murphy) and insert this idea, and make him believe it came from him. This is known as “Inception”. Cobb will be joined by his team that includes Arthur (Gordon-Levitt), and a young architecture student named Ariadne (Page). Despite everything said about this movie, I thought it was pretty straight forward. 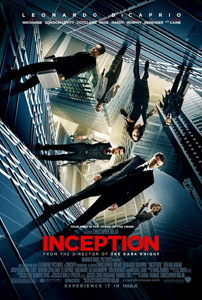 Of course, repeat viewings of the film would be more than useful, but as a regular movie, Inception delivers as much thrill as any action flick released this season. The cinematography is breathtaking at times, combined with special effects that drags you into the story. The acting is more than solid, it’s DiCaprio’s most interesting role since his snubbed performance on Revolutionary Road, and I could easily see nominations for supporting acting for Joseph Gordon-Levitt and Marion Cotillard. Of course, it doesn’t hurt at all to have an interesting story as the base of this action thriller. Dreams are interesting, and leaves you enough space to mess around with people’s minds without making them feel like you’ve cheated on the story. I’m not sure, however, if this is deserving of a #3 spot on the current IMDb 250 Top Films yet, but it’s definitely one of the most interesting offerings of the year. Leave it to Nolan to deliver something like this.